Alright Momma, it’s getting close and you know you’re maternity leave is right around the corner. It’s time to make sure all your questions are answered before it’s too late. Here are five important questions you need to have the answers to before your baby arrives. Will I have a job when I return? If your employer has to comply with Family Medical Leave Act (FMLA) then your current position is protected up to 12 weeks. However, you do have to meet certain requirements: you have to have worked for 12 months and a total of 1,250 hours during the last 12-month period. If your employer has to comply with FMLA and you qualify, then your Human Resources Officer will have forms that need to be completed by your doctor or midwife. However, if your employer does not have to comply with FMLA. Then this would be a good time to ask the question — will I have a job when I return? Most employers will want to work with you to make sure you have a position when you come back. You might have to work with them to create a plan for who will be handling your daily and weekly tasks while you’re away. Or if they are going to be bringing in a temporary worker while you’re gone. Will I be paid for my maternity leave? Paid maternity leave is up to each individual employer and their policies. It is not a requirement by the federal government. You will need to sit down with your human resources department and ask them directly this question. Or do research in the company handbook. If your employer does not offer paid leave, then you might qualify for short-term disability. You should talk with your insurance agent to get more details. The only catch with short-term disability is you have to sign up before you’re pregnant. What happens to my benefits while I’m on maternity leave? Will I need to pay for my health insurance coverage? Will my 401(k) continue? Do not worry! Your employer cannot stop your benefits. 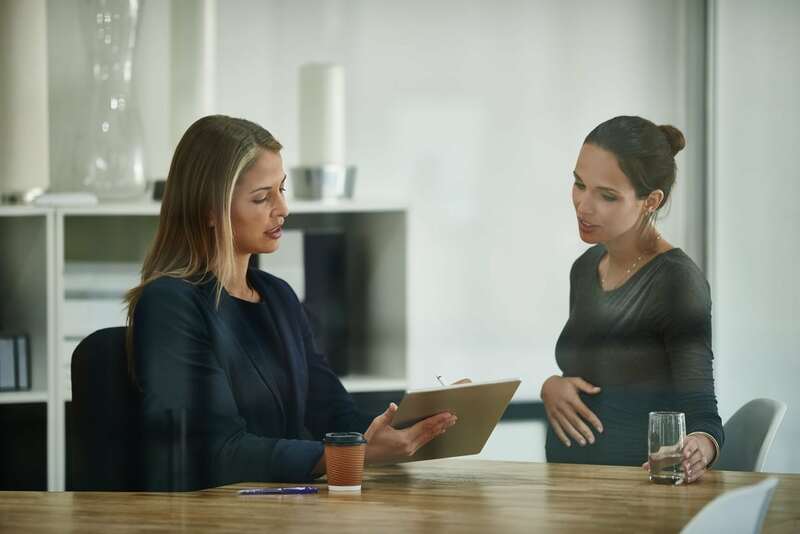 If you are receiving paid maternity leave then the amount that is regularly taken out of your paycheck to cover health insurance and retirement benefits will continue. However, if you receive unpaid maternity leave, you may be asked to pay the health insurance costs directly. How do I add my baby to my health insurance after they’re born? More than likely you will need to ask your human resources officer this question. You do not need to worry about adding your baby until after he or she arrives. The insurance company will need your baby’s date of birth and name to get them added to your plan. If there are additional costs to your plan for adding a new family member then you will be expected to pay the difference or have it withheld from your paycheck. During the birth your child is placed under the mother’s name and is listed as one patient — the mother. If for some reason your child is admitted to the NICU. Or kept longer than the mother then it is a separate incident and will be billed to the child’s name. How long is my paid maternity leave? What happens if I want to take the full 12 weeks? Remember maternity leave means two different things: recovery from childbirth and bonding with your newborn. Under FMLA the mother is given 12 weeks for both parts. So just because your doctor tells you can return to work after six weeks, you are entitled to an additional six weeks under FMLA. Each employer can offer a variety of paid or unpaid maternity leave. You could have paid coverage for four weeks, six weeks, eight weeks or even 12 weeks. Your doctor may also require you to take longer than your office provides. If that is the case then you will need to notify your employer or your Human Resource Officer as soon as possible. Remember your human resources officer is the best place to start if you have questions regarding maternity leave or notifying your employer of when you might want to start your leave. Wife, Mom, Budget Strategist and Certified Financial Planner.